BlackSci-Fi.com: Tell us about yourself and Nerdtino Expo. 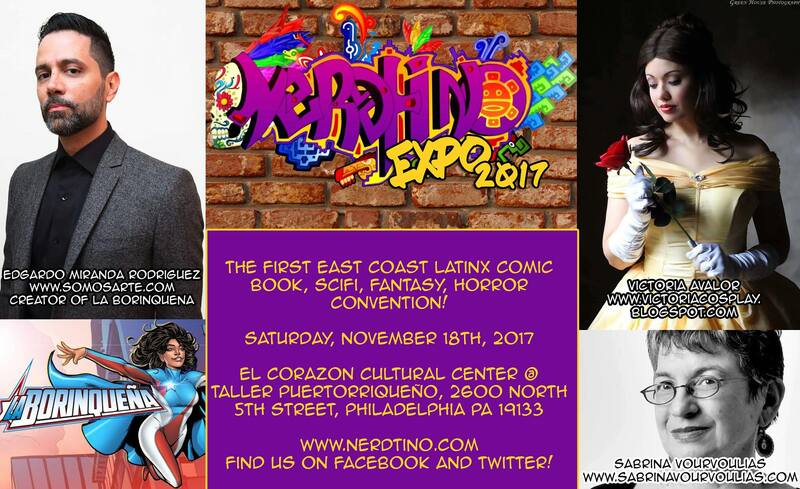 Thomas Delfi: Nerdtino Expo is the First East Coast Latinx Comic Book Convention, coming to Philadelphia, November 18th, 2017, hosted at Taller Puertorriquenuo. Our hope is to use that traditional model of the Comic Book Convention to promote the history and presence of Latin American, Hispanic, Xicano, Afro Latinx, and Afro Caribbean creators and fans in Geek Culture. 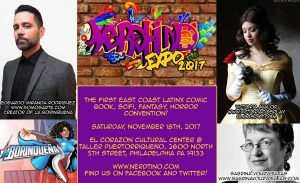 I am a Puerto Rican Historian and Museum Professional based out of Pennsylvania, founder of the Nerdtino Entertainment Studios and the Nerdtino Expo. BSF: How did you go about putting Nerdtino Expo together? TD: We started with establishing a community that is now 1,500+ strong to promote and network Latinx creators and fans, from science fiction and fantasy literature to comic books and cosplay. While I always had the idea to do a convention at some point, I wanted to see how much of an audience and community there might be for what we are trying to do. We took our cue from the African American community, who have been very organized in promoting their creators for the last 20 years whereas Latin Americans hadn’t done anything to this scale before. Everything used to be very localized, but our community operates at a national scale, embracing a diversity of Latinx creators and fans as members of our community. Through the community we started to identify potential guests, networking between cousin shows like the Latino Comics Expo in California and Sol Con in Ohio, and from there we established our organization’s team and our featured guests. We began traveling to shows like PAX East and BlerDCon, promoting our show and giving presentations on Latinx presence in Geek culture. It has been one Hell of a journey. BSF: What do you feel sets Nertino apart from other conventions? What kind of creators and panels will you be featuring there? 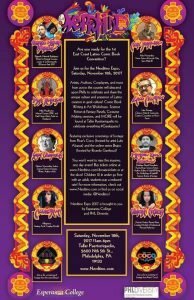 TD: Our featured guests include Marvel Comics writer and creator of La Borinquena, Edgardo Miranda Rodriguez, Mafia 3 Voice Actor for Lincoln Clay Alex Hernandez, Mike Hawthorne of Marvel Comics who will be hosting a comic book writing and art workshop with local nonprofit Mighty Writers at our show. 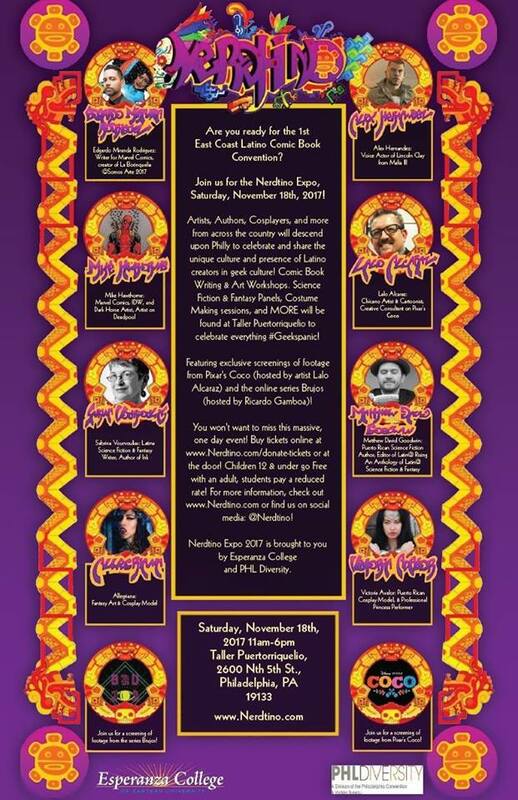 Authors Sabrina Vourvoulias and Matthew David Goodwin of Latin@ Rising: An Anthology of Latin American Science Fiction & Fantasy, Chicano Cartoonist Lalo Alcaraz who will be hosting a screening of Exclusive Footage from Pixar’s Coco, and more. As an event, Nerdtino is meant to be more for the uninitiated. We have designed this show to cater to both conventional convention goers as well as Latin Americans who may not have been exposed to as much geek culture and felt isolated from it. So many Latin fans, young and old, have felt alone in the convention community, treated like an immigrant in geek culture. But the truth is Latin Americans have built at least a quarter of geek culture and for people to feel like that shows is wrong. So our show is less of a party and more of a educational, engaging convention. BSF: If you could invite any Latinx creator to Nerdtino Expo, who would it be and why? TD: John Leguizamo. He has always been an inspiration to me, the persevering Latino in media, and he has currently been very invested in the idea of promoting Latin stories in media. He’s even working on a comic book with one of our guests, Edgardo Miranda Rodriguez. BSF: Why do you believe that Nerdtino Expo is a necessary convention for Latinx fans and creators? TD: I don’t like to qualify in those terms. If you start talking about what is necessary and unnecessary, you try to qualify what you are doing in relation to those who might disagree. We have the right to create what we want for the reasons we feel are right. I believe that this show, whether you are Latinx or not, is a positive thing and will make geek culture stronger, more inclusive, and more vibrant. 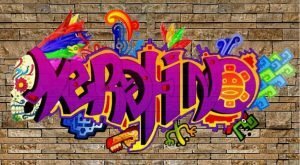 Registration for Nerdtino Expo 2017 is now open! Join us for the 1st East Coast Latino Comic Book Convention! Guests and Programs include creator of La Borinqueña Edgardo Miranda-Rodriguez, Authors from Latin@ Rising, a special screening of footage from Pixar’s Coco with Lalo Alcaraz and the online series Brujos, a Comic Book writing and art workshop with Mike Hawthorne of Marvel Comics, and more! Learn more at www.Nerdtino.com and on FB. 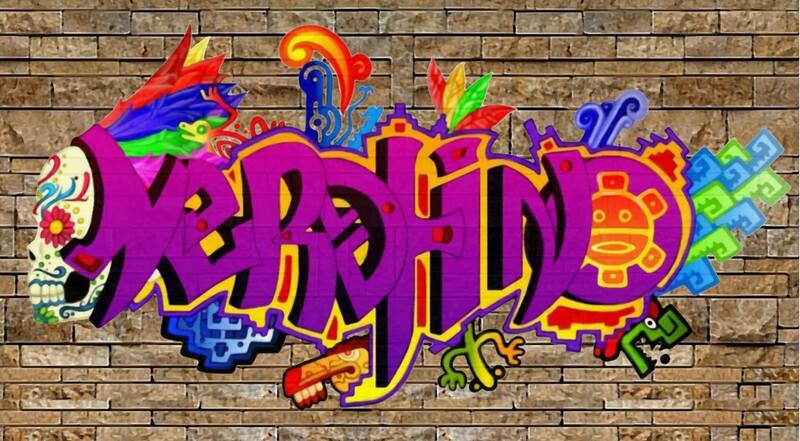 Nerdtino Expo 2017 is brought to you by Esperanza College of Eastern University and PHL Diversity.